We spent two days in Gettysburg before heading to Washington, D.C. where we spent five days walking our legs off! 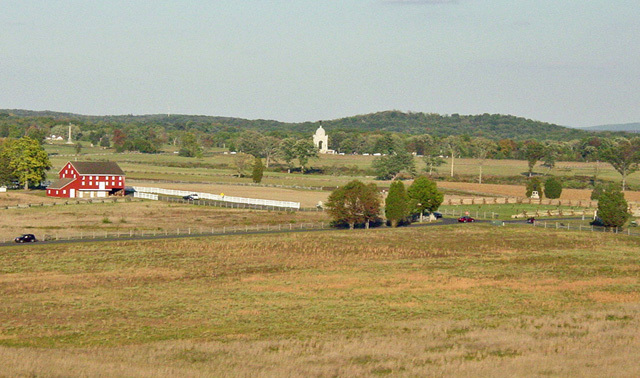 This is a broad view of the field between Cemetery Hill and Seminary Ridge at Gettysburg. Here many men lost their lives during the three day battle ending July 3,1863. Casualties for the Union army were 23,000, and for the Confederate army 28,000. Looks peaceful today. 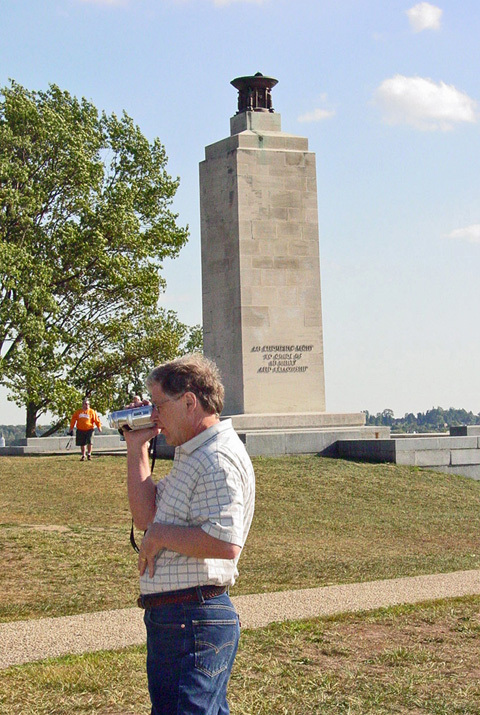 Mike filming at the Eternal Light Peace Memorial. From this hill Maj. Gen. Robert E. Rodes's Confederates attacked the Union forces on nearby McPherson and Oak ridges. General Robert E. Lee mounted on Traveller atop Seminary Ridge. July 03, 2001, 7:30 AM. 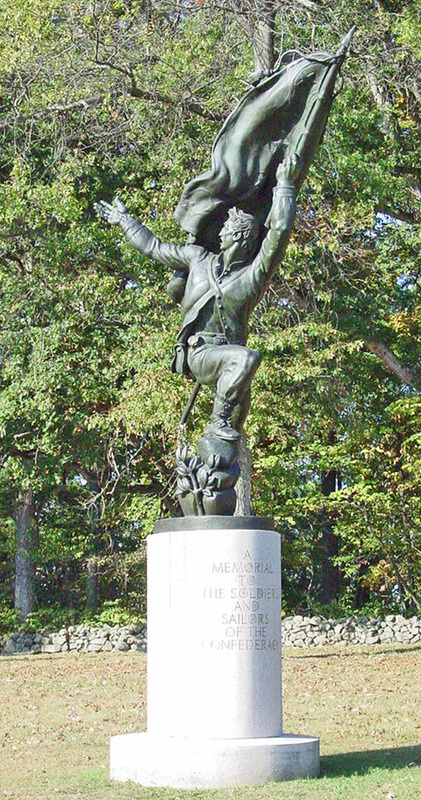 A memorial to the soldiers and sailors of the Confederate Army. The visitor center at Gettysburg had an abundance of information explaining the details of the battles and also exhibits of the actual equipment used by the soldiers. From Gettysburg we made a quick side trip to Middletown, Pa. where Mike spent part of his childhood. 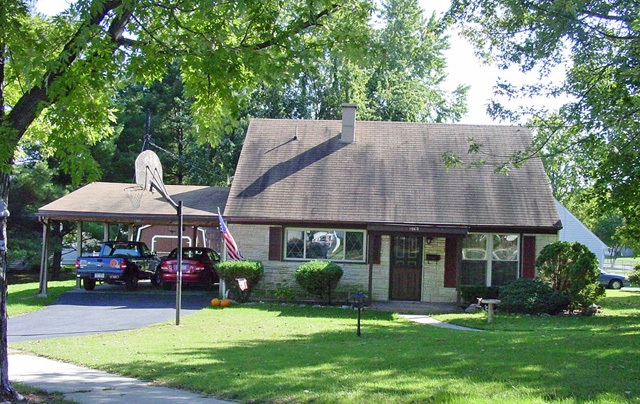 This is the house at 1060 Spruce Street where he lived. Mike didn't remember it being so small ! After leaving Middletown we made our way to Washington DC. We stayed in the Days Inn on Connecticut Ave. just a few blocks from the subway. 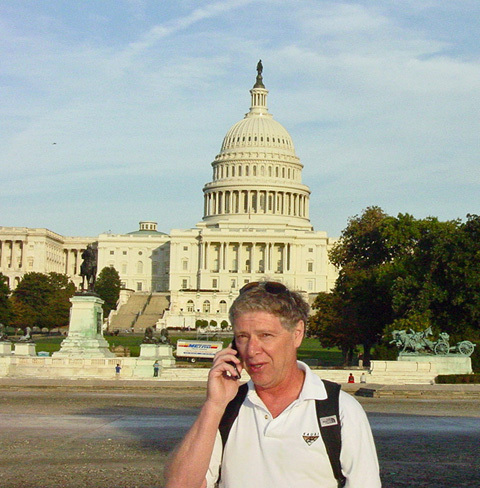 Here Mike is conversing with his dad Freddie in front of the Capitol. He made a game of daily calling his dad or sister and asking "guess where I am?" Another up close and personal view of the Capitol Building. 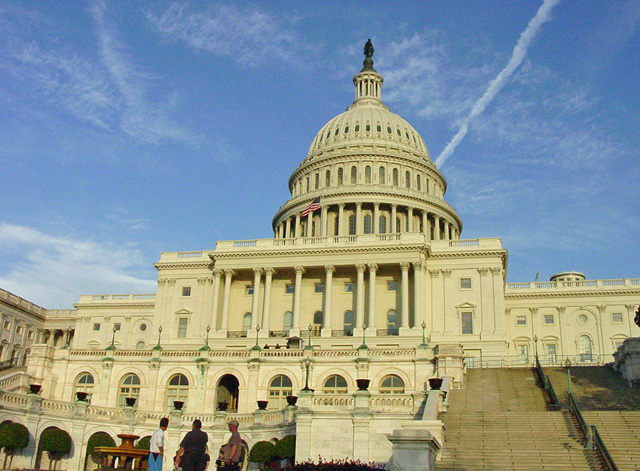 It houses the Chambers of both the Senate and the House of Representatives and is one of the most recognizable symbols of democracy in the world. 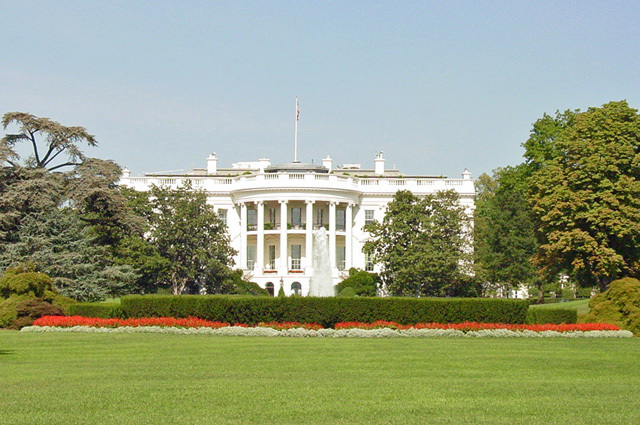 The White House, home of the President of the United States and the seat of the Executive Branch of our Government. President George Washington and Pierre L'Enfant chose this beautiful site. The weather during our visit was perfect for outdoor picture taking. The Supreme Court building. Here the nations highest court hears cases and controversies arising under the Constitution or the laws of the United States. 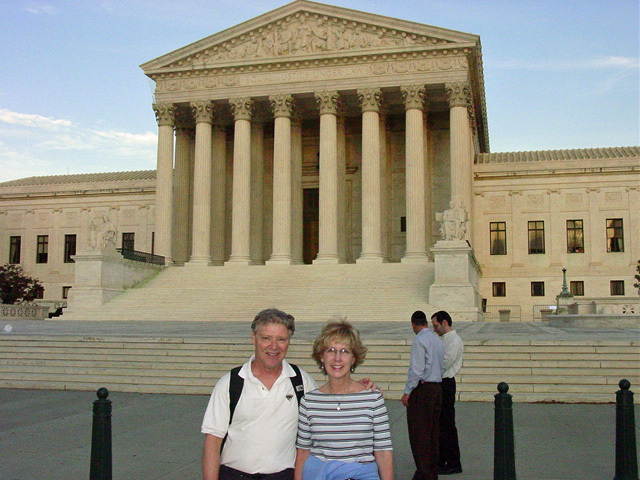 The building, designed in the classical Corinthian style, depicts American legal themes. 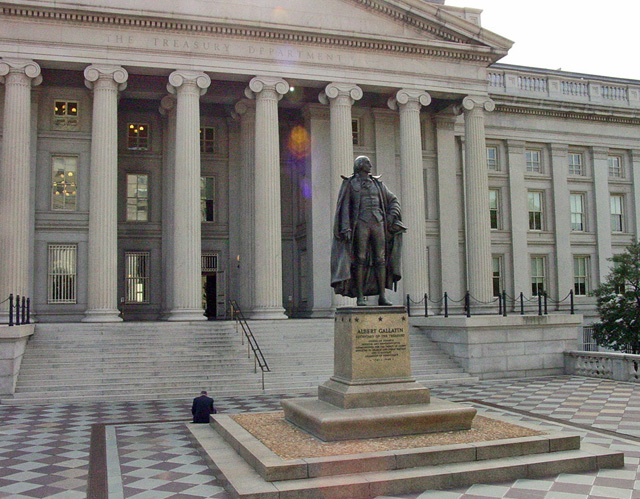 The Treasury Building is the oldest departmental building in Washington, and the third oldest federally occupied building in Washington, preceded only by the Capitol and the White House. The Main Treasury Building covers five stories and a raised basement and sits on 5 acres of ground. The Lincoln Memorial stands at the west end of the National Mall as a monument to the 16th President. 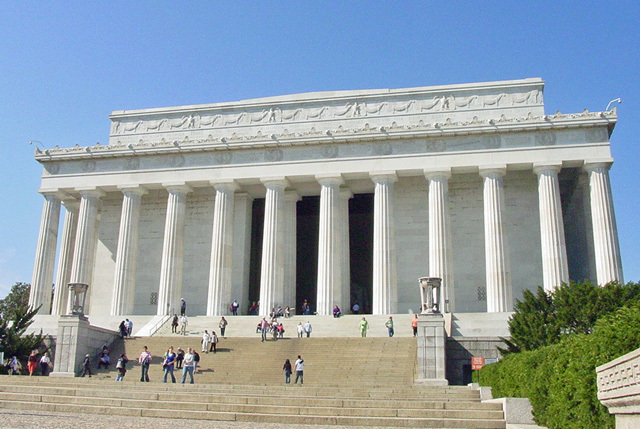 It is surrounded by 38 columns, one for each of the thirty six states in the Union at the time of Lincoln's death, and two columns at the entrance. The north and south side chambers contain carved inscriptions of Lincoln's Second Inaugural Address and his Gettysburg Address. Lying between the north and south chambers is the central hall containing the solitary figure of Lincoln sitting in contemplation. The statue was carved in four years by the Piccirilli brothers. 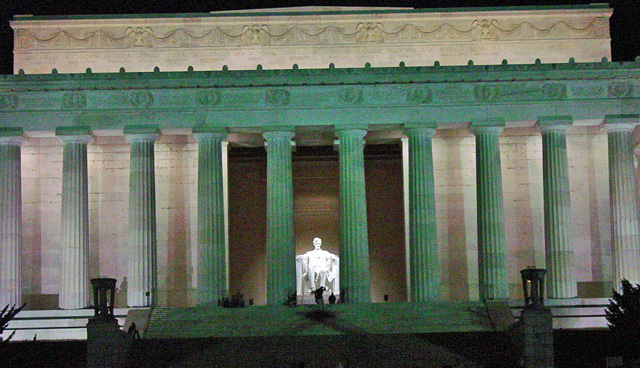 The statue of Lincoln is 19 feet high and weighs 175 tons. 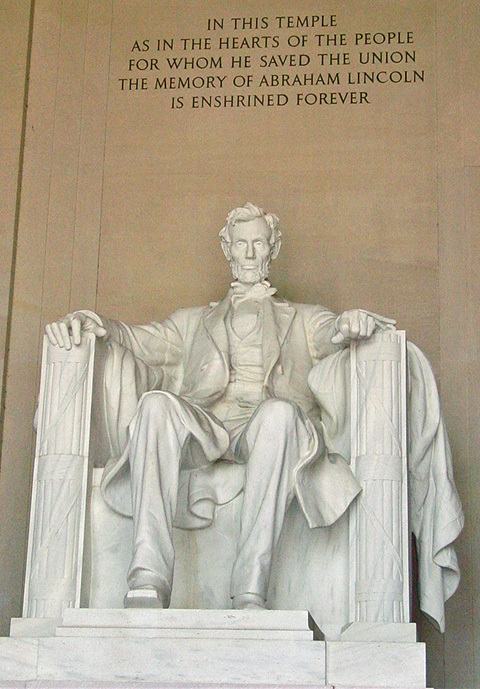 The original plan was for the statue to be only ten feet high, but this was changed so that the figure of Lincoln would not be dwarfed by the size of the chamber. A commission to plan a monument was first proposed in 1867, shortly after Lincoln's death. Congress finally approved the bill to construct this memorial in 1910. Construction began in 1914, and the memorial was opened to the public in 1922. 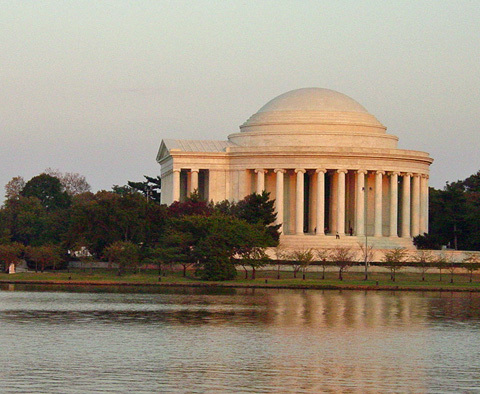 Situated on the South side of the Tidal Basin, in West Potomac park, the Jefferson Memorial is one of the cities most picturesque landmarks. This simple circular classical white marble monument has at its center, a 19-foot bronze portrait statue standing on a 6-foot pedestal. Panels are inscribed with excerpts of Jefferson's writing, including one that best sums up the man: "I have sworn upon the alter of God eternal hostility against every form of tyranny over the mind of man." 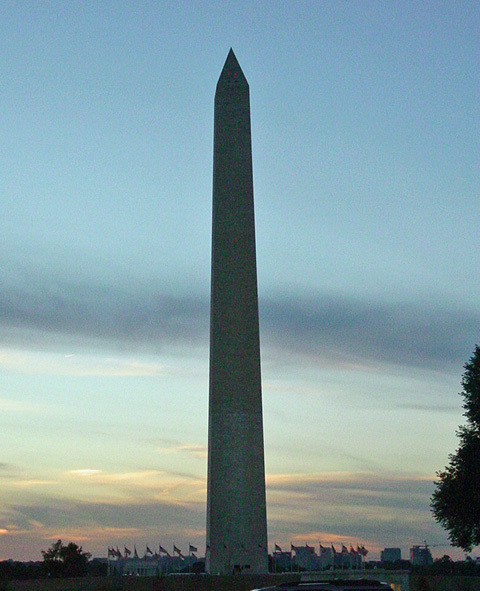 Evening shot of the Washington Monument. This monument, built at intervals between 1848 and 1885 with funds from public subscriptions and Federal appropriations, memorializes George Washington's achievements and unselfish devotion to principle and to country. On July 4, 1848, the cornerstone was laid. Work progressed until 1854, when the building of the monument became involved in a political quarrel. This affair brought construction to a halt. 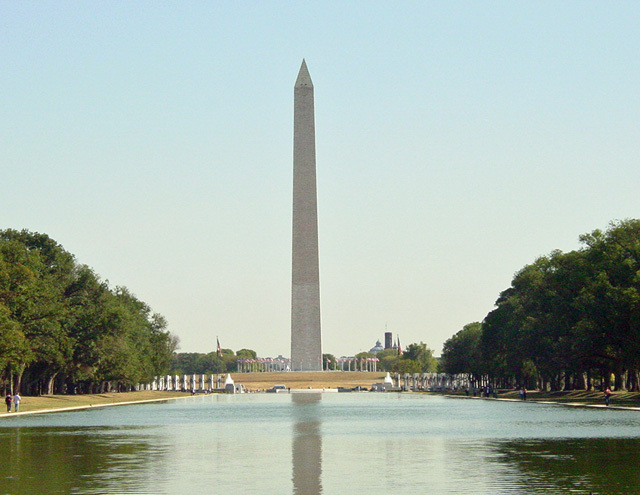 Finally on August 2, 1876, President Grant approved an act which provided that the Federal Government should complete the erection of the monument. In 1880, work was resumed on the shaft. 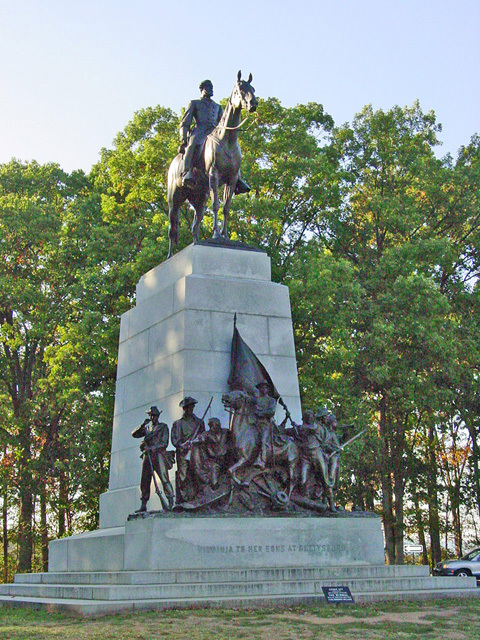 The monument was dedicated on February 21, 1885, and opened to the public on October 9, 1888. On July 1, 1980, President Jimmy Carter signed the legislation to provide a site in Constitution Gardens near the Lincoln Memorial. 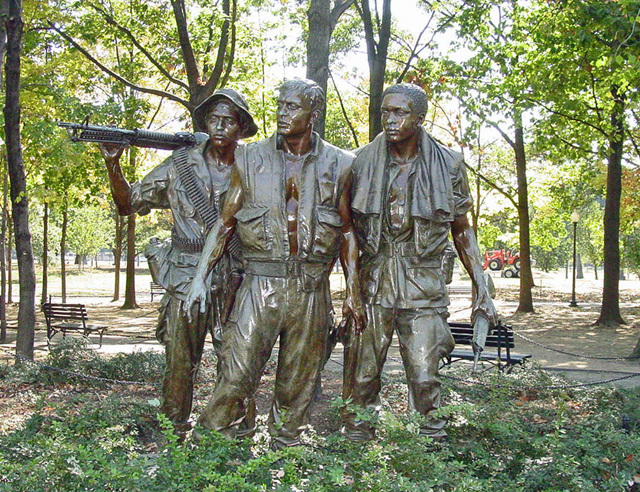 It was a three and half year task to build the memorial and to orchestrate a celebration to salute those who served in Vietnam. 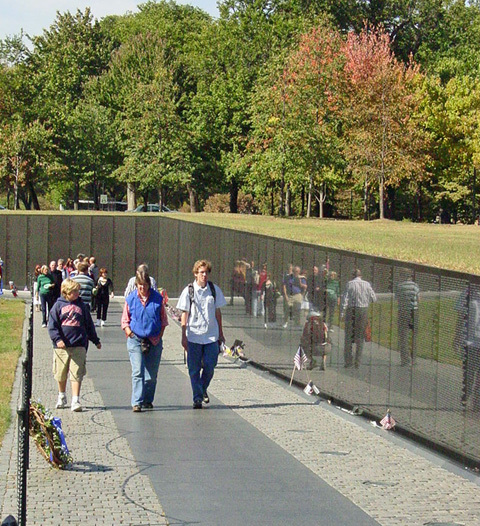 The latest three names added in 2007, brought the number of names on the black granite Wall to 58,256. 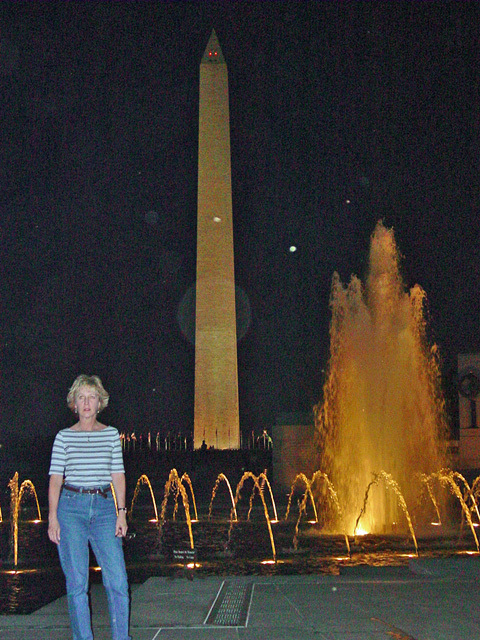 Night shot of Kathie at the WWII Memorial and Washington Monument in the background. 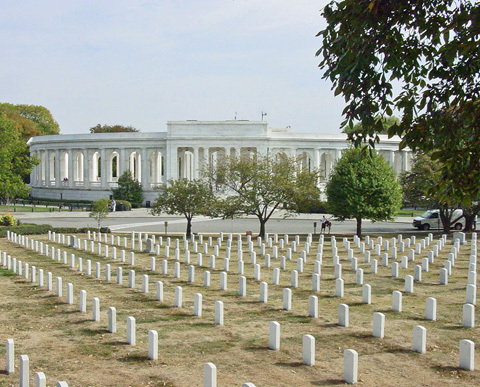 President Clinton signed the law May 25, 1993, authorizing the American Battle Monuments Commission to establish a World War II Memorial in Washington, D.C. It is the first national memorial dedicated to all who served during World War II and acknowledging the commitment and achievement of the entire nation. The WWII memorial honors the 16 million who served in the armed forces of the U.S. during World War II, the more than 400,000 who died, and the millions who supported the war effort from home. 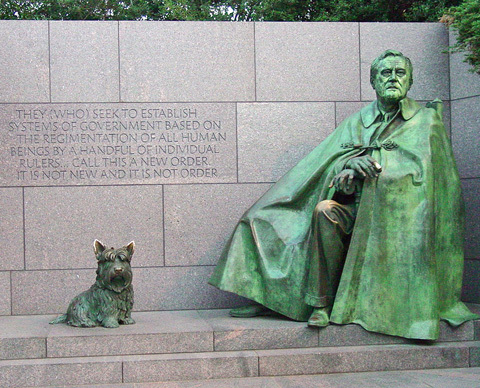 FDR and his dog "Fala"
In August 1955, Congress established a commission to create a memorial to Roosevelt, the 32nd U.S. president. Four years later, a location for the memorial was found. The memorial was to be located half way between the Lincoln and Jefferson Memorials, along the Tidal Basin. 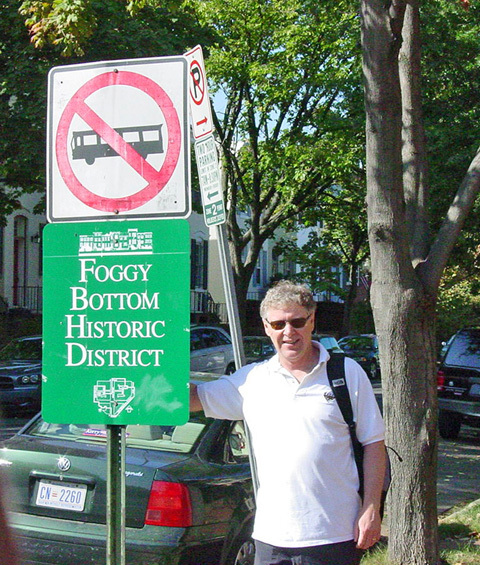 Mike near the metro station in the Foggy Bottom District. 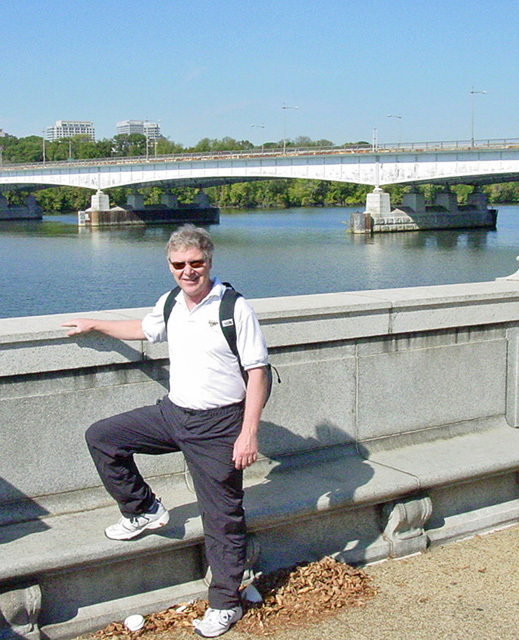 Mike on walking path by the Potomac River. In the background is one of the five bridges that cross the Potomac River connecting Arlington, Virginia and Washington, D.C. 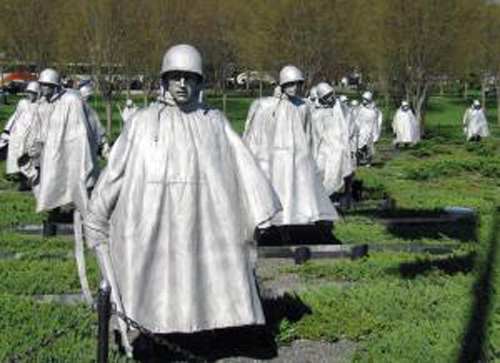 The Korean War Veterans Memorial was authorized on Oct. 28, 1986 "…to honor members of the United States Armed Forces who served in the Korean War." Made up of 19 stainless steel statues representing a squad on patrol. 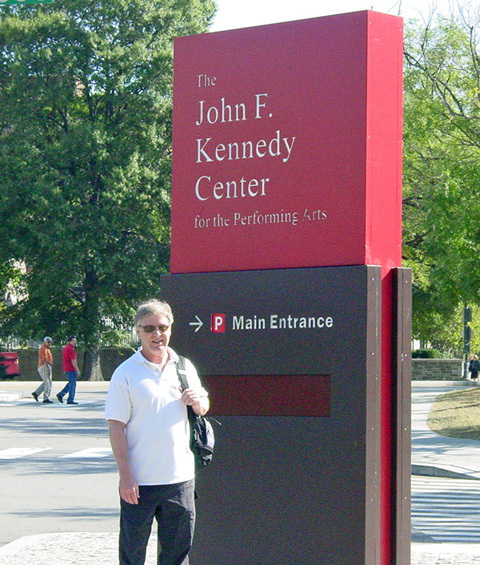 Mike by entrance to John F. Kennedy Center. The John F. Kennedy Center for the Performing Arts, is a performing arts center located on the Potomac River, adjacent to the Watergate Complex in Washington, D.C. It opened in 1971. The three main theaters at the Kennedy Center are the Opera House, Concert Hall, and the Eisenhower Theater. 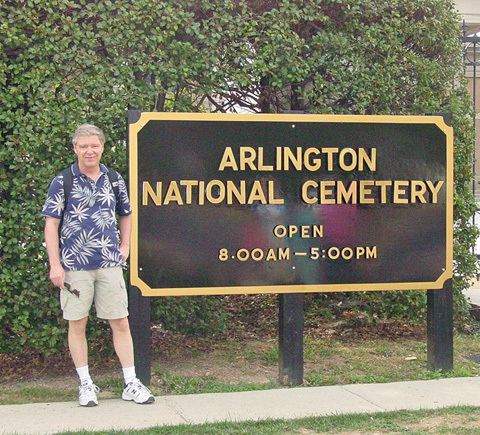 Mike at entrance to Arlington National Cemetery. Veterans from all the nation's wars are buried in the cemetery, from the American Revolution through the Iraq and Afghanistan. Pre-Civil War dead were re-interred after 1900.